I told you she was up to no good!! 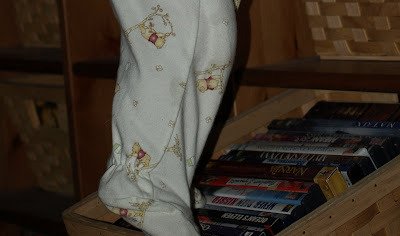 Here is Lori's new favorite thing to do, reach the things on the coffee table that we've pushed out of reach by pulling out a basket of DVDs and using it as a step. Evil genius! Ok so maybe she's not EVIL but still... she's to busy for OUR own good! This post is LONG over due, almost embarrassingly so but it's such an important thing that it feels wrong not to post it at all. 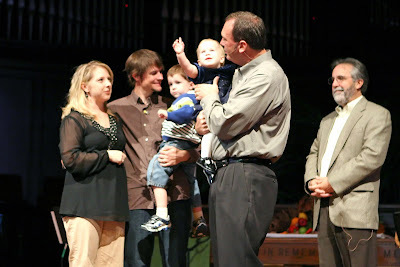 On November 22, 2008 we had Lori dedicated at Grace Presbyterian Church, our church here in Houston. My family was able to be here so that was really awesome. It was a first for Grace. 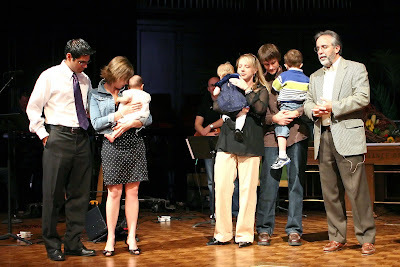 They had never dedicated a baby before, they have always done baptisms. 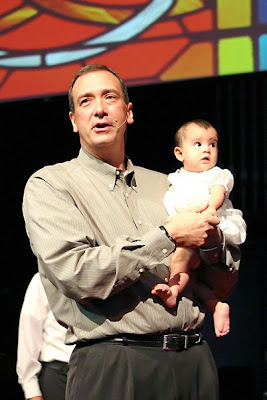 Jorge and I decided that we would like to give Lori the choice to be baptized someday when she is old enough to understand what she's doing and what it means. 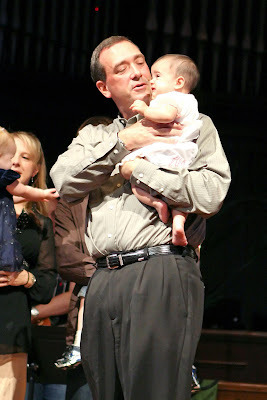 This was also a first for our pastor, Doug Ferguson. (Doug married us in Menlo Park four plus years ago, moved to Houston a few months later and then we came out a year or so after that...) In all the years that Doug has been marrying couples and dedicating/baptizing babies he's never dedicated/baptized a baby who's parenthe'd married the parents, until now. :) Lori was the first! We were really excited that our very good friends Ben and Jenna Kuykendall also had there daughter Rachel dedicated that same weekend!! It was SO special to be able to share that experience with them. We love "doing life" with them out here. Here are some shots of Doug dedicating the girls. Is anything more fun than a cardboard box? bouncy chairs are NOT for climbing! This is why she got a tunnel for Christmas! Playing with the kitty's bowl! "helping" put away Christmas decorations. Lori will do what ever it takes to check email! She went IN to my purse and got out my wallet and then OPENED it... I thought I was a few years away from that.